Growing up around horses, Tina Rocco, M.A. CCC-SLP, HPCS knew that one day she would love to incorporate the majestic creatures into her career. 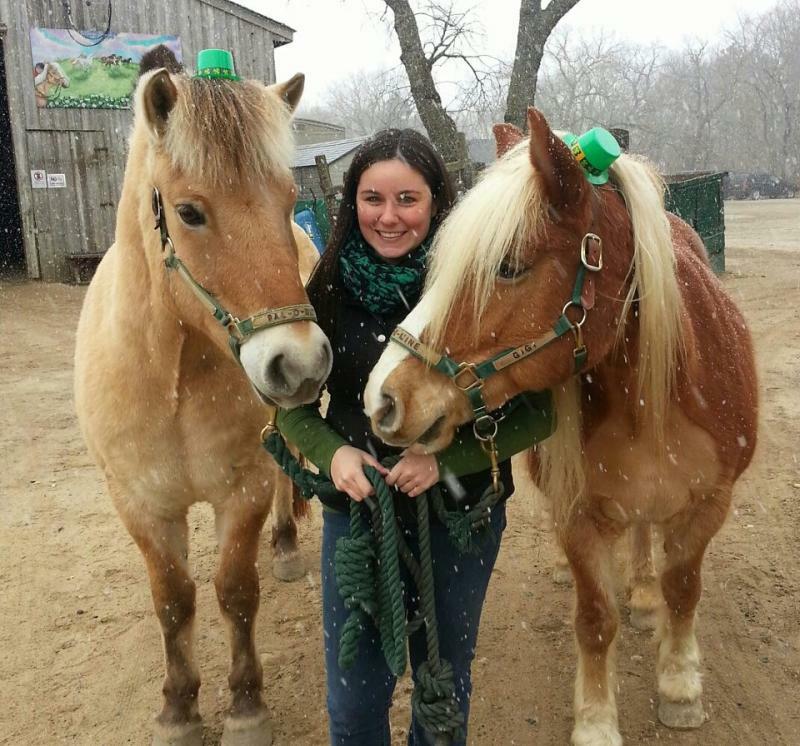 While studying speech language pathology at Long Island University, she discovered the perfect way to work with two of her favorite subjects: children and horses. In 2011, Rocco started her private practice, Speech Language Pathology in Motion. In her practice, equine movement, also called hippotherapy, and animal-assisted speech therapy are treatment strategies that are incorporated into patients’ treatment plans when appropriate. 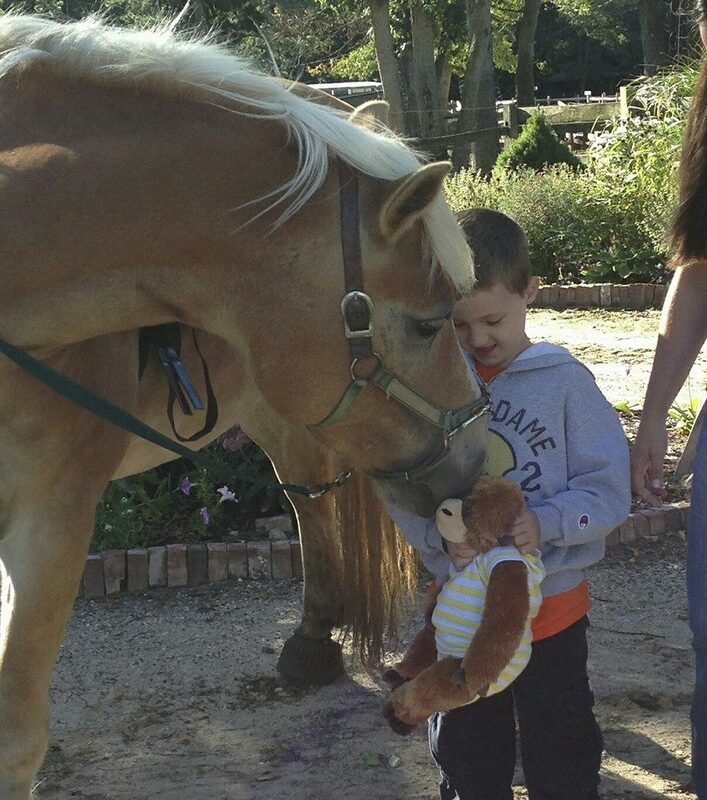 Rocco decided to incorporate hippotherapy and animal-assisted speech therapy as treatment approaches because children interact differently with animals and have a unique reaction to them. Children develop a nonverbal connection with animals and are less hesitant around them which can be crucial for children with speech and language difficulties. Tina Rocco & horses she uses as part of Speech Language Pathology in Motion“There is a special connection between my clients and the therapy animals,” said Rocco. Speech Language Pathology in Motion contracts with Pal-O-Mine Equestrian in Islandia, New York and works with six of the facility’s therapy horses. The farm also houses goats, miniature horses, miniature donkeys, chickens, bunnies, and cats that clients interact with during sessions as well. All clients also receive treatment at Speech Language Pathology in Motion’s clinic located in Hauppage, NY. This allows them to practice their speech and language skills in different settings and generalize their skills faster. Along with offering hippotherapy and equine-assisted speech therapy as treatment options, the practice also offers Prompts for Restructuring Oral Muscular Phonetic Targets (PROMPT) therapy, the Developmental, Individual Difference, Relationship-based (DIR) Model, and the Sequential Oral Sensory (SOS) Approach to Feeding therapy. Rocco sees about 30 clients weekly with most attending therapy sessions one to two times per week. Her practice is primarily pediatric, though she does have several adult clients as well. Rocco is one of only six Speech Language Pathologists in the nation who is recognized as a Board Certified Hippotherapy Clinical Specialist from the American Hippotherapy Certification Board. In addition, she currently serves on the Board of Directors for The American Hippotherapy Association. Rocco integrates horses into her practice in order to motivate clients, provide sensory input, and develop clients’ motor components. Clients often get excited to come to sessions with Rocco when they know that they get to spend time with the horses. They have the opportunity to practice using their language to tell the horse to “go” or explain what they want the horse to do. This motivates the client to use language for a rewarding purpose. Clients also play games while on the horses which gives them the opportunity to practice speaking to the horse while having fun at the same time. Working with horses also appeals to clients’ sensory skills. Horses provide proprioceptive input, which is movement through the joints and through space. Clients strengthen their motor skills by using postural control to sit on the horses and move with the animal’s body. Being on a moving horse helps clients improve their trunk support, which in turn, helps improve breath support, an important component of speech production. The horses that are used by Speech Language Pathology in Motion are specially picked for each client’s individual needs. The horses are selected based on their conformation, personality traits, size, and soundness. All horses must be completely sound at the walk, trot, and canter, and their movements are analyzed to ensure they will address a client’s needs for therapy. While Rocco is open to using a variety of breeds of horses, most of the horses currently in use at her practice are Quarter Horses, Haflingers, and Norwegian Fjords. These horses need to be relaxed and calm so that they will be comfortable with loud noises, startling surprises, and being surrounded by a number of people. There is a great deal of training that the horses are given before they can be used for this type of work. For example, the horses must be trained to be handled in different ways. Often in the therapy sessions, the horses are driven from behind, using a technique called long lining. Horses are also trained to work with a variety of toys and equipment including wheel chairs so they are comfortable with these items before they are used in a speech therapy session. Families often seek out the treatment strategies offered by Speech Language Pathology in Motion when they are looking for private speech therapy to supplement what their child gets in school, additional support, or something new and different from other speech and language practices. The practice’s unique offering of treatment approaches keeps clients from getting burnt out in therapy and may appeal to clients who have not been receptive to other traditional approaches. She said many clients leave a therapy session and want to talk with their friends, families, and teachers about their time with the horses which triggers speaking opportunities in between therapy sessions. The clients get attached to the horses and staff. They develop a strong bond as they work as a team. They get excited to show the horse things they’ve discovered or demonstrate a new sound they’ve learned. Additionally, clients get practice being in a social language situation during sessions because there are three people around the horse and client at all times. Conversation is always underway and clients learn to become more comfortable using their social skills. Rocco has seen many clients go from not speaking at all to becoming verbal after participating in speech therapy incorporating hippotherapy and equine-assisted speech therapy. She has had several clients say their first word while on a horse. In one instance, Rocco was working with a client who had been struggling with aggression in other speech settings. When getting speech therapy using the horses, his aggressive behavior decreased and the unique setting really seemed to click with him. On another occasion, Rocco had a client with a lot of sensory processing difficulties. He exhibited many self-injurious behaviors in other settings which negatively impacted his ability to improve his speech and language skills. However, when Rocco addressed his sensory difficulties through equine movement, his behavior completely changed, and he could make greater progress with his speech goals. 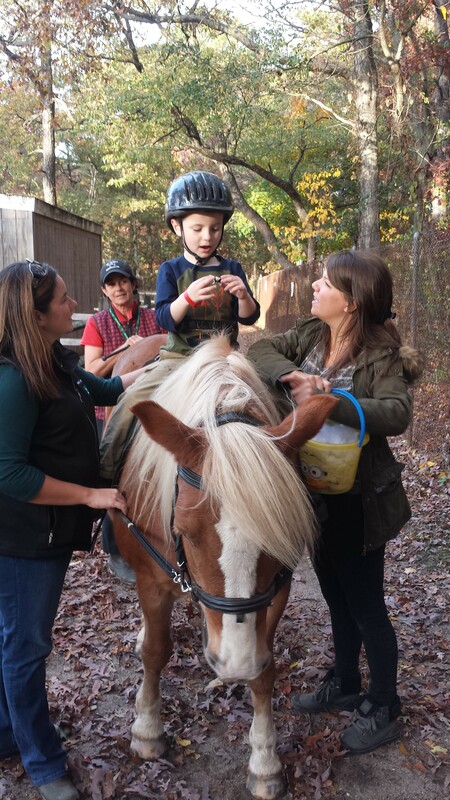 Parents tend to be very satisfied with the improvements seen in their children after participating in speech therapy incorporating hippotherapy and equine-assisted speech therapy with Rocco. “Due to Speech Language Pathology in Motion, [my son] is doing amazing and making incredible progress and improvements with each and every session - not only with his speech, but cognitively, with his fine and gross motor skills, and sensory processing, one of his biggest challenges,” said one parent. Rocco has been truly amazed by the results she has seen by partnering speech therapy and horses. In the future, she looks forward to expanding her practice and helping more people achieve their speech and language goals through interaction with these wonderful animals. For more information about Tina Rocco and Speech Language Pathology in Motion, visit their website.